As sociable as Amazon’s smart assistant may at first appear, Alexa has never mixed well with Windows. Until now. Historically, Alexa has played nicely with smart speakers, TV sticks, robots, refrigerators and even shower-heads. Yet, despite a recently announced partnership between Amazon and Microsoft announced, Alexa still hadn’t fully opened her door to the PC. At CES this week, the folks at Acer finally coerced Alexa from the comfort of her Echo and into its new notebooks, all-in-one PCs – and even a 4K projector. “Acer is delighted to be among the first brands to bring Alexa to PCs,” cooed Acer’s chief matchmaker and IT products chief, Jerry Kao. “By introducing voice services like Alexa,” continued Intel’s Anand Srivatsa, “we anticipate that the PC will serve an even more important role in maximising your productivity, getting the most from your entertainment, and managing the smart home or office.” Oh Anand, you old romantic, you. Of course, part of Alexa’s charm on her native Echo is how well she listens, thanks in no small part to her half-dozen or more keenly tuned microphones. The problem with a typical PC is that basic integrated mic gear won’t always cut it, which is why Acer has brought in Intel’s Smart Sound DSPs to handle the audio input and output. 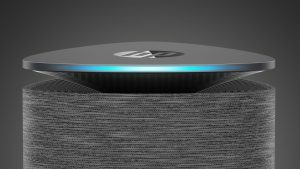 Managing the interaction back to the Amazon cloud is the new Amazon Alexa app – common across all Alexa-espoused PCs, for now, and separate from the yet-to-materialise Cortana/Alexa collaboration. Asus says Alexa will come to select Aspire, Spin, Switch and Swift models in the US first, with support in other territories arriving in mid-2018. 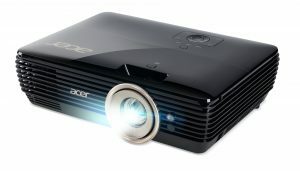 The firm’s new V6820M and V6820i 4K projectors are shortly to be primed for voice control too. This one technology promises – in an instant – to reclaim the five minutes lost from every meeting to inevitable projector operator incompetence. Acer doesn’t get to keep Alexa all to himself, however, with Taiwanese love-rival ASUS also caught courting the Amazon assistant. However, HP pipped its A-list rivals to the post with the fabric-clothed HP Pavillion Wave PC. The neatly-packaged Wave boasts B&O Play surround-sound audio, and specs up to a beefy Intel Core i7 with 16 GB RAM and dual monitor support. That the Wave resembles a muscular, more modern take on Alexa’s previously prefered bedfellow, the Amazon Echo, may be entirely coincidental. But expect this to be just the first of many fruitful Alexa hookups with eligible PCs in the months to come.